First and foremost, as human beings we fear the worst outcomes. For some profound reason a majority of us are programmed to act proactively to guard against the worst. This is why life insurance is annually a multi-billion dollar business. Yet far fewer of us meal prep, or change our oil at exactly 4999 miles, and we don’t all make the bed each morning, but why? Frankly, because failure to do those types of preparations don’t result an immediate negative outcome, worst case scenario we are eating lunch at a fast food joint at noon or our “Change Engine Oil” light comes on. Secondly, we must contextualize something before we dive much deeper, the scenario of my plane going down or my car sliding off the cliff is albeit “the worst”, but that preventative action I took, the fact I have life insurance does nothing to physically help me in those moments nor does it act a step that could have prevented my current descending situation. A calcium intervention is actually very similar to life insurance. Both are critically important, there is a clear and established need, more is always better, and frankly with both calcium and life insurance they are pretty expensive, maybe even overpriced, and we don’t really ever know if we got our money’s worth. Assuming we employ a DCAD and our nutritionist is sharper than the average rusty nail I would venture a guess that clinical milk fever incident rate at your dairy is less than 3%, maybe less than 1%. Yet every cow that freshens gets $8 worth of calcium bolus shoved down her throat plus the labor to administer it, and now she’s guarded against milk fever. Not just milk fever you say, hypocalcemia too. Hypocalcemia is bad, it just sounds nasty it ends with “emia” and that’s not good. New flash, nearly all mammals become hypocalcemic, this is part of lactogenesis! Mammals can’t signal the mobilization of stored bone calcium without a shortage in the blood. But hypocalcemia leads to milk fever and we fear the milk fever cow, she goes down, we have to IV her and she is “ruined” now for her whole lactation. Let’s take a 10,000-foot view at what we’re doing. Secret 1# is pretty simple: Supplying the cow with more. We know she needs calcium, that has been well documented. A majority of data suggests calcium supplementation will have no effect on dry matter intake. Ultimately, we need all cows to be self-sufficient, to be able to eat her formulated diet to satisfy her nutritional needs. Calcium needs to be a box on the list we check, but not the only item on the list. We need to stimulate her appetite, by helping her rumen adapt to the changing diet and making sure her liver is functioning properly. She needs potassium to replace her depleted stores from calving and drive the uterine involution. She needs magnesium to absorb dietary calcium, the oral calcium provided by boluses is rapidly bioavailable to the animal but is not a long-term answer to the hypocalcemic issue. When evaluating fresh cow programs, managers must be recognizing if they are addressing one need of the fresh cow or taking an approach to address them all. Metabolic diseases associated with the transition period, annually cost the dairy industry millions of dollars in direct treatment costs, but further cost the dairies millions of dollars of indirect costs associated with lost production and reduced lactational performance. The transition cow undergoes a myriad of complex interrelated metabolic shifts to support lactogensis. Traditionally we have cited negative energy balance (NEBAL) as the cause for the for the deleterious and cascading transition cow dysfunction observed. 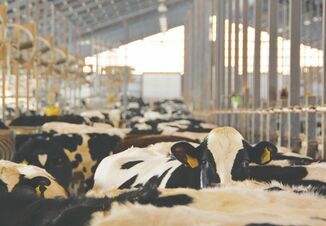 However, all cows and most mammals enter a state of NEBAL, and hypocalcemia, following parturition yet not all cows, in fact only about 40%, are treated for a clinical metabolic disorder. The causation of this discrepancy between herd contemporaries is still being fully understood, however we do understand immunosuppression is likely to be involved. While many of these questions remain unanswered, we are learning more about the immune system’s energetic and nutritional requirement. The immune system takes occupancy in many internal organs, but the largest by surface area is the intestinal tract, which means not only means are immune system is vast and complex, but consider the amount of surface area it is responsible for defending. As it relates to the fresh cow, immune system activation, measure by lipopolysaccharide binding protein (LPSBP) has been observed as early as multiple days precalving, suggesting that potentially some cows are at a disadvantage before they ever “transition”. The precise source of the immune challenge is unknown, speculation could be made that it stems from the uterus, or a result of decreasing dry matter intake, or perhaps another yet to be determined source. Interestingly, animals that receive an LPS challenge become hypocalcemic, an observation that was tested, validated, and published by (Waldron et al., 2009). The causation of immunoactivated hypocalcemia is thought by some to be due the fact that calcium is a requirement in the cellular process of immune function that this may the sink for the observed “disappearance of blood calcium”. No peer reviewed research to date has been able to quantify how much calcium is involved in lactogenesis and how much is diverted for use by the immune system in fresh cows. We inherently assume the drain in blood calcium is solely to support milk production. If this were completely true it fails to explain why all cows do not respond the same as their contemporaries, why some cows fed DCAD diets and given oral calcium boluses can still incur clinical hypocalcemia. The logical progression is then to assume those cows aren’t eating to support their needs. Secret #2: Minimize her challenge. Get her out of overcrowded unclean dry cow and prefresh pens. Don’t make heifers compete with mature cows at the bunk. Deliver a balanced TMR and try to limit the sorting of the prefresh diet. Give her every opportunity and incentive to eat prepartum. Economics and practicality limit the number of pens we can have and effectively maintain. If money grew on trees and we were not limited by labor and human capital restraints, what would we add to our dairy? Popular answers might be an extra fresh pen, a dump pen, or a hospital pen for the critically ill animals. Hence the forgotten pen, we don’t give the early fresh cow enough consideration. Upon review of her hours leading up to parturition she will encounter potentially three to four pen movements (prefesh, calving pack, dump pen (all too common) and ultimately to the fresh pen. In each of these pens she could be exposed to new contemporaries and dietary changes. We are going to take her from a very basic pH rumen environment to one with exponentially more starches and greatly increase the rapidly fermentable fraction of her diet in comparison to what she was receiving a mere few hours ago. We are asking her to expel a calf, placenta, and undergo a massive loss in fluid volume from her body. We are then going to demand that her uterus rapidly involude to make way for an expanding rumen. Metabolically things are going haywire, calcium needs are ramping up, NEFA’s too are on the rise, blood glucose is on a decline, we hope her blood insulin levels are low and while she was calving her rumination likely hit nadir and is rebounding, but is likely all over the board. How do we account for all this in our management and nutritional strategy? The answer, simply put is, we don’t – in fact we do a poor job. Let’s walk back through nutrition 101. How do we build a ration for any animal? First, we need to understand how much that animal is capable of consuming. After we understand that we can then better formulate and balance a diet to match her intake levels. Then we need to understand what that animal is actually consuming. So, in a pen of animals that range from day 1 to day 15 in milk the variance in that anticipated intake level is widely variable, I can confidently predict that a cow at day 15 in milk that’s making 95# of FCM and has the lactational pedal to floor is probably eating 100-200% more than a day 1 fresh cow. How do we supply each cow with what she needs? We can’t. Before every nutritionist shows up in Stewart, Minnesota with torches and pitch forks I must issue the disclaimer, in a pen feeding scenario (i.e. what 99.9% of production agriculture employs) we feed to the pen average. In summary at the most critical time of that cows’ life, early lactation, we are probably not supplying her with a nutritionally dense enough ration. Secondly, examining the needs of that day one fresh cow. She needs calcium. Calcium is more readily absorbed and metabolized when her blood pH is slightly acidic. The prefresh DCAD would be taking care of this, but she’s freshened and where did we just move her? To the fresh pen, and a DCAD there is highly positive, thereby hindering her ability to reach a eucalcemic state. Secret #3: Early lactation cows need to be managed differently than what we have traditionally done. In a world of no limitation they deserve their own pen, in reality they deserve supplementation of multiple nutrients to help bridge the gap from formulation to consumption. Consider shortening the herd days in the fresh pen to help more appropriately dial in the dry matter intake of fresh cows. Rumination can be a very useful proxy to determine if she’s eating at an appropriate level and track day to day deviations. If it snows on Christmas does that mean that snowing caused Christmas? As kids this would be complete euphoria if it was true, as present buying adults it is probably good the North Pole cranks out toys once a year. When it comes to diagnosing and treating ketosis it seems to be white out conditions. Hundreds of published articles have shown that high ketones and ketosis are associated and have negative outcomes on production. We have to apply some critical thinking to this approach; an association is markedly different than a causation. We really like it when it snows on Christmas Eve, it makes it much more magical to wake up to a fresh blanket of pure white snow. However, we know Christmas is coming regardless of snowfall, it’s a nice association but not a causation. The nail stuck in your tire is the causation as to why it went flat. The traditional urine ketone measurement should not be the determining factor in our ketosis treatment protocol. We need to employ secondary metrics to a ketosis protocol, is she running a fever, did her rumination drop, is she down in milk, or does she have a previous challenge (metritis, twins, excessive body condition score) that could set her up for a ketosis bout. Ketones are released in response to heightened fatty acid oxidation by the liver. Ketones have gotten a bad rap because the process of converting fat to glucose in the ruminant, requires energy and can overwhelm the liver. Typically, high ketone levels can be found in high producing herds. Is this a bad thing? It would make logical sense that a cow that is making high amounts of milk would have higher energetic demand and thus blood ketone levels, because she is metabolically sensitive, would be heightened which allows her the ability to make glucose from what she eats and manufacture it from her adipose stores. High production doesn’t likely happen without the ability to make adipose into sugar to fuel production. 1. Is she aggressively eating during herd lock ups? a. Is she digging a hole in her feed? 2. Does it appear her rumination dropped or her production dropped recently? 3. Does she have a temp? a. A low-grade fever could be an excellent secondary indicator if she’s got an infection. The dairy cow is subject to her biology, she will make milk that is 87% water but cannot make milk that is 50% water one day and 95% water the next to offset water quality issues. Simply put, it is the quantity entering the bulk tank is that is impacted, less water consumption means less milk. Water sampling and cleanliness protocols takes minutes to do, and cost almost nothing in the grand scheme of expenses. The real dollars can be found in what an operation is leaving on the table because they are not accounting for their animals’ largest nutrient requirement. The concept of adult ruminant hydration traditionally has been lost at sea, only lacking a compass to accurately make the assessment if our ship is headed on the right course. A rumen is a large fermentation vat that contains well over 10 gallons of digesta (feed and water) at any point in time throughout the day. Which raises the question, “If she’s got water on board is she ever truly dehydrated?” Odds are probably not from a clinical need vs supply standpoint. For instance, evidence suggests that based on blood hematocrit values, cows experiencing heat stress are super hydrated. Is hematocrit the right gauge to discern our cows’ hydration status? Some would suggest that as with calves, evaluating the orbital-socket-to-eye gap is the best way to access hydration status of mature ruminants. 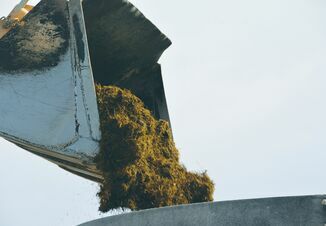 Regardless of method of hydration assessment, we know that stress events in a cow’s life such as changes in feed, freshening, and heat stress, can turn the tables of metabolism—and therefore, we can’t assume water is always hitting quality targets and is efficiently transported and effectively used. Water quality metrics are recorded and assessed most commonly in parts per million. That means out of a million particles, five or less may be zinc, or 0.05 might be manganese, or less than 20 of them are nitrates. Peanuts, right? Wrong. The problem is two-fold. First, the tolerance level of imbalance is low in part because the cow consumes more water on a daily basis than any feedstuff. 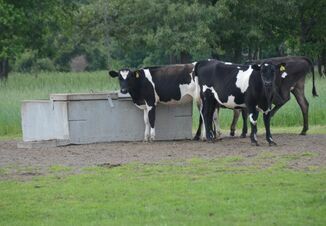 In fact, the water requirements of the dairy cow on a body mass index surpass that of any other land-based mammal (Beede, 2005), and is second only to oxygen in importance for survival. Second, milk is 87% water, so it’s easy to calculate why her water requirements are through the roof, and also why a tiny imbalance can become a big problem. Secret #5: Make water sampling part of a protocol. What you are looking for in a water test is not only the results of that test, but also a trend of relative sameness. Do we observe results that are similar each time we sample, or do our results vary wildly? We cannot exactly pinpoint where our water comes from, it is entirely possible our water may be greatly impacted by the surrounding environment while your neighbors’ may be far less variable, we don’t know until we sample and can establish a pattern.